Adding solar powered landscape lighting and other features to your landscape is one of the easiest and most affordable ways to make excellent use of the clean, abundant energy from the sun. Solar technology becomes more efficient and affordable by the day, and is an excellent source of low-voltage power for a wide variety of landscape features and functions. In this article, we will answer some common questions on the topic of solar landscape features and equipment. We will also provide some smart tips to help you save money and enjoy a cleaner, earth-friendlier way of life. 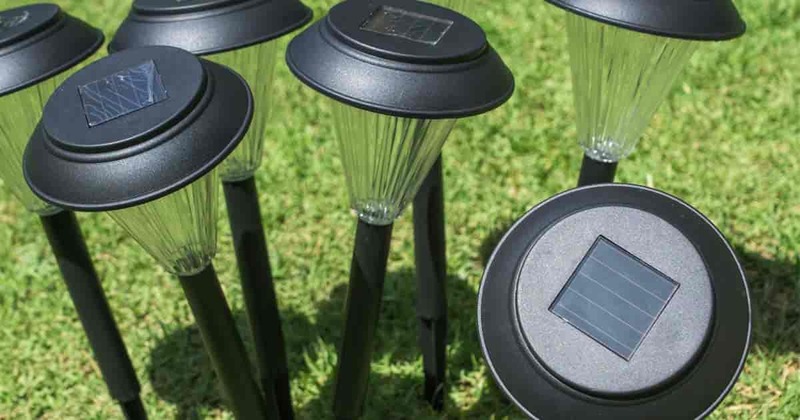 Read on to learn more about solar-powered landscape lights. Does Solar Powered Landscape Lighting Cost A Lot Of Money? What If I Don’t Get Much Direct Sunlight? Many people mistakenly assume they cannot use outdoor solar lights because their area does not get a lot of direct sunlight. Unless you’re trying to light completely in the shade of a tree, this is really not a concern. Solar technology has improved greatly in recent years, and modern high efficiency panels and equipment like LED (light-emitting diode) lighting make the most of every ray of sunshine. Today’s options in solar lighting fixtures are made using extremely efficient photovoltaic cells and efficient rechargeable batteries with the capacity to store great amounts of energy for use when the sun is not shining. The solar PV panel (solar photovoltaic) convert sunlight to electricity and stored in the battery for use at night. Even in areas without a great deal of direct sunlight and in seasons with shorter days, you can count on solar powered features to function properly. Solar panels require very little maintenance. This mostly involves checking to be sure all connections and anchors are tight and secure, brushing away debris and cleaning off dirt. For your smaller, self-installed panels, check them periodically to be certain they are not prone to falling or being tipped over. Sweep away leaves and debris. Wipe the pv panel surface with a clean, damp cloth to be sure dirt is not obstructing the sunlight. How Long Do Solar Panels & Fixtures Last? The longevity of your solar unit varying depending on what it is. Naturally, walkway and path light stakes bought at your local dollar store will not last as long as a high-end solar security light setup. Still, you may be surprised at just how long those dollar solar light sticks do last! Do LED Solar Features Really Provide Adequate Light Output? In the past, solar garden lighting only produced dim light output and did not store enough energy to burn all night long. Today, thanks to improvements in technology and the use of brilliant LED bulbs, this is no longer the case. LED low-voltage lighting puts out a tremendous amount of illumination using a very small amount of power. As a result, you will get dazzlingly bright lighting for an impressively lengthy period of time with this winning light source combination. Another advantage of LED bulbs is their solid state construction making them even more efficient for use in outdoor lighting. For example, if you live in an area where the wintertime temperature is very cold, you can count on your LED lighting fixture to burn even more brightly in response. This is in sharp contrast to fluorescent lights, which tend to dim when temperatures drop. LED lighting requires far less electricity than standard bulbs. Additionally, LED lights burn safe and cool. Combined with improved energy storage technology, LED lighting helps make solar a long-lasting, dependable choice for amply lighting your yard, outbuildings and home. Will I Really Save Much Money? 1. Hire a licensed electrician, pay for materials, pay for labor and then pay your local utility company to power your new additions every month. 2. Do it yourself, save a few bucks, run the risk of voiding your homeowner’s insurance policy or starting a fire with unauthorized electrical additions and pay your local utility company to power your new additions every month. 3. Hire a solar installation expert, pay for equipment, pay for labor and have a professional solar installation that may actually reduce your homeowner’s insurance payments due to providing licensed security features to your property. Power your new features free of charge with the energy of the sun. Under some situations you can qualify for government reimbursement and/or tax credits for your installation. 4. Purchase standalone solar powered systems designed for easy DIY installation. Install your new lighting or other features yourself in a few hours. Power your features for free with abundant energy from the sun. You may enjoy a discount on your homeowner’s insurance if your new features enhance the safety and security of your property. Grid powered features cost you money from the outset and continue to cost you money for the life of the feature. It’s easy to see when you go solar, your main expenditure is the initial purchase and (if you go with a pro) installation. From there on, you’re saving all the way. In terms of aesthetics, the sky is the limit when it comes to choices in solar powered hardware. You can find low voltage landscape lighting, yard and garden features available in every imaginable material, finish and style to match your decorating tastes and setting. With so many manufacturers to choose from, and each one offering a full lineup of solar lighting, it is easy to find the right fixtures for any setting. Solar lights continue to grow in use and are being included more in the overall design phase of a landscape. Here’s a few tips on solar landscape lights and LED landscape lighting kits when you’re out shopping for them. 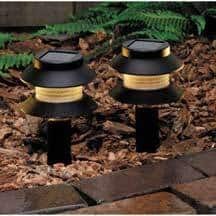 Use solar landscape lights to increase visibility and safety on pathways, in your garden, deck area, or yard as well as being highly cost efficient to help reduce electric bills. The batteries in solar lights recharge during the day. Their battery should have hold enough charge to power the bright LED lights all throughout the night… up to 12 hours. One of the best features of solar landscape lighting is not just their visibility but also their versatility and ease of use anywhere. No electrical wires and extension cords make placing them almost anywhere in the yard or on a deck a breeze. How Versatile? Extremely! Install solar lighting in the garden not only on the ground, but on walls and fences, decks or patios. Place path lights or hanging lights along a sidewalk to spill over and illuminate a safe walking path or highlight a part of your garden with solar spot or solar flood lights. The choices now available for solar lighting is wide. The offerings feature stylish designs and finishes in black, silver, brown, copper, white, or even antique finishes all designed to enhance not only the look but lighting in your landscape… from the backyard, outdoor deck, frontyard or entrance to your front door. How much light does a solar light produce? The “lights” used in the design of solar lights are LED’s… the more LED’s a light has the more light and area it will illuminate. Standalone lighting kits are inexpensive, easy to install and add both beauty and security to your outdoor setting. Below are some ideas for selection and use of standalone solar lighting. Standalone systems require no cords or wiring. You simply install the lights in a sunny location of your choosing and you are done. Individual standalone lights placed in sunny locations will soak up and store enough energy to power bright LED bulbs for as long as twelve hours at a time. This makes LED’s a very dependable and convenient source of all-night lighting. If you want to light an area that does not get good sunlight during the day, you can select a setup that makes good use of independent solar panels. These sophisticated models typically come equipped with automatic on-at-dusk and off-at-dawn function so you do not have to bother with setting up a timer. Paneled systems collect sunlight from a strategically positioned solar panel, store it as energy and then convey that energy to lights or other features as needed. This makes it possible to set up solar powered features in areas that do not receive direct sunlight during the day. You can use a combination of standalone and wired solar lighting systems to light up pathways, steps and staircases, edges of flower beds (it looks really cool), decks, sheds, outbuildings, ponds, pools and more. Solar is also an excellent choice when it comes to powering security lights, flood lights and other safety features. To make your landscape more aesthetically pleasing, choose solar accent lights. This type of lighting emits a low and pleasing glow or even a flickering candlelight effect. It does not necessarily add to safety or security, instead, it is intended to draw attention to an area or provide a pleasant appearance. Solar rope lights work well for this lighting technique. This type of lighting needs very little power and can run for a very long time (days at a time) on a single day’s collected sunlight. Accent lighting is typically powered with very efficient multi-crystalline solar cells. This means they can get a full charge even in areas not receiving lots of direct sunlight. They can also receive a full charge on cloudy or overcast days. Accent lights use LED bulbs for even greater energy efficiency; however, these bulbs are often amber tinted to provide a soft and pleasing glow. This type of LED light uses even less electricity than standard LEDs, so you can always count on your accent feature to light up and stay lit each and every evening. While accent lights do not provide a lot of illumination, they can be creatively used to provide a degree of safety. For example, if you have a tripping hazard in your yard, you can draw attention to it artfully with well-placed solar accent lighting. Solar fairy lights are a lovely example of year-round accent lighting for your garden that can provide both beauty and function. These lights are very similar to Christmas lights, but they are available in non-holiday colors in bright, energy efficient LED twinkle or glow bulbs. They make a beautiful and decorative addition to shrubbery, trees, outdoor structures and other areas where you want to draw attention and add excitement. Strung artfully through the branches of trees and paired with effective pathway lighting, they brighten the night beautifully and add an element of safety. Installing them is as easy as putting up your Christmas lights. In fact, left up year-round they can certainly add to the festivity during the holidays. To install, just string the lights wherever you please and set up the attached solar panel in a sunny location. This type of lighting comes equipped with an automatic on at dusk, off at dawn function for simplicity and ease of use. If you purchase and set up your fairy lights in the morning, they will be completely charged for a full night’s enjoyment that very evening. Because they are lightweight and portable, they make a wonderful addition when camping or enjoying an evening event in the park. Just be sure the solar panel gets fully charged, and you’re ready to go. The use of solar path lighting provides bright illumination and guidance and an added level of safety to your landscape. This type of lighting is available in boxed standalone sets which you can install easily along walkways and stairwells; around ponds and in other areas needing illumination for safety. Most path lights are installed by simply poking the built in stakes into the ground alongside the path, Other options come with hanging hooks and flange mounts in areas where stakes cannot be used. This type of lighting has a simple on-at-dusk/off-at-dawn way of functioning, or you can also get models with an on/off switch allowing the fixture to store power and use the lighting only as needed. Units equipped with timers are also available. Like all solar lighting options, path lighting comes crafted in every imaginable style, material and color to suit your landscaping design needs. These lighting choices can be quite costly, but they provide the very brightest light and can contribute significantly to the safety and security of your property. While solar powered high-intensity lights are not as bright as grid-powered versions, they still produce an impressive and functional amount of light. Lighting which can draw attention to landscape features and illuminate doorways and dark areas of your property for added security. This type of lighting may come as a standalone kit with a small solar panel built in, or it may come with a larger solar panel that can be placed separately and connected to the lighting feature via wiring. This type of unit is typically more powerful and long-lasting. A paneled configuration allows you to set up lighting in shaded area such as a porch, vestibule or outbuilding and mount the panel on the roof or atop a pole. In this way, the panel collects light all day and illuminates very dark spaces all night or as needed. This type of lighting may turn on at dusk and off at dawn and/or it may include motion detection activation properties and an off/on switch. This type of solar lighting is typically the most ruggedly constructed and the most durable choice of all. Solar security lights are not only easy to install and affordable, they make the perfect choice for outlying areas of your property that do not have electrical wiring in place. Using a standalone kit or even having a solar powered security lighting system professionally installed will save you money both in terms of installation and operation. Another excellent advantage in choosing to use solar security lighting is the fact that DIY options are quick and easy to install, allowing you to be very responsive to need. If you have security problems in your neighborhood, you can make the decision to add security lights and have them in place all within the span of a few hours. This compared to taking days or even weeks to make arrangements for professional installation. When you find a wide variety of available options when shopping for solar powered security floodlights and spotlights, For example, you can find units that operate on timers or continuously from sundown to sunset, or ones equipped with motion sensor or motion detecting technology causing the lights to turn on when someone or something moves about in the area. This provides an added level of security and gives the impression someone just turned on the light. Related Reading – The Best Solar Garden Lights With Motion Detection? When choosing solar lighting specifically designed for security purposes, you have the option of choosing halogen bulbs rather than LED bulbs. Halogen bulbs burn brighter. They do not have the same lifespan advantages as LED, but for the purpose of security you may prefer them. TIP: When choosing a solar lighting feature, be sure replacement parts and bulbs are readily available. Keep an extra bulb or two on hand for convenience. Once you’ve lit up your garden and landscape with solar, adding a solar panel to the roof of your pool house looks like a logical next step in ridding yourself of fossil fuel dependency and lowering your energy costs. A single, high efficiency solar panel can provide a great deal (if not all) of your energy needs for your pool lighting, care and maintenance. In addition to decorating and lighting up your poolside setting with solar, you can also make good use of solar energy to run your underwater pool lights, the heater, filtration and cleaning equipment. Systems for running fountain and pool equipment with battery backup capabilities allow you to choose your equipment’s operating times. This means you can enjoy your pool or water feature using energy from the sun no matter what the weather or the time of day or night. Likewise, pond pump equipped with a solar panel can run your waterfall, the filtration equipment and heater in the wintertime. New, attractive and fascinating choices in solar powered pool and pond features are created every day. Check your local garden center and pool supply store and/or search online for kits and products you can easily install to make your pool or pond more attractive and easier to care for. Solar landscape features work well in most settings; however, it is important to follow manufacturer’s recommendations and follow some basic best practices for best results. Even though full sun exposure is not absolutely necessary for the latest and greatest in solar panels to work well, remember you will always get the very best results with full southern exposure. Manufacturer’s instructions typically suggest how many hours a day of direct sunlight are required for the proper functioning of any solar lighting fixture. Be sure to provide the minimum number of required hours’ sunlight. You will also notice manufacturers listing a “nightly run time” in the description and instructions. This, too is dependent upon the lighting fixture getting the right amount of sunlight. Understand your results may vary depending on weather conditions. Extended periods of cloudiness and overcast conditions may cause some lower quality light fixtures to falter. However, a high quality fixture with a powerful rechargeable battery and ample storage capacity you may not notice any difference in performance. If you notice performance suffering, check for any obstructions that may prevent your panels from charging. Leaves, bird droppings or dirt can interfere with charging. If an obstruction remains in place for a long time, it will reduce battery life significantly. Once you’ve dabbled in solar power to enhance the beauty and security of your yard, you’re sure to want to extend your newfound knowledge to the rest of your home. If you are simply adding solar to your existing landscaping and home, there are so many ways to do it that it can be a very satisfying creative project.